If you’d like to add polyurea projects to your lineup, the Reactor E-10hp High Pressure Proportioner is a smart, affordable investment that can help your business grow. 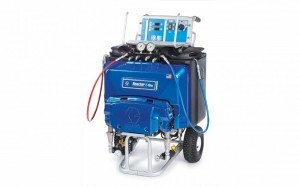 The Reactor E-10hp provides the high pressure power and performance you need to spray polyurea coatings. It’s lightweight and portable – and runs on residential power so you don’t need to invest in a generator.